I wonder if this intends to show the Confederate attack on the 21st Wisconsin in the cornfield in front of the 1st WI/79th PA position. The following narrative tells the story of the Lancaster County Regiment in its first battle, the Battle of Perryville. It is my attempt to synthesize over a dozen primary source accounts of the 79th Pennsylvania with the story told by Ken Noe in his campaign study Perryville: This Grand Havoc of Battle. 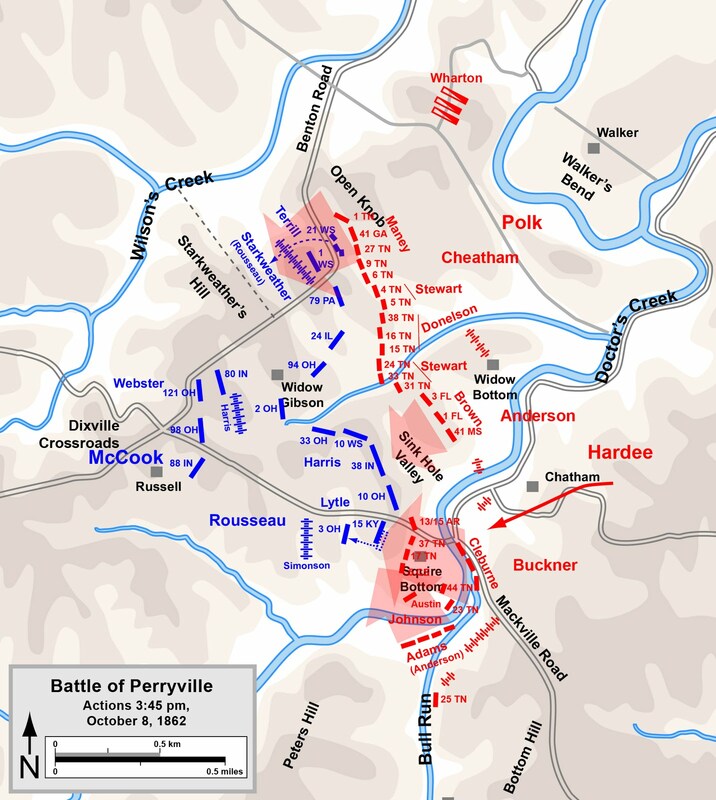 If not explicitly referenced in the post, sources should be pretty obvious to identify in the "Sources" and "Battle of Perryville" tabs. A note about sources: The most confusing part of parsing battle accounts for the 79th Pennsylvania is determining what refers to actions on in each of the regiment's two positions. For example, even after much reading, I'm still not sure whether the regiment took more casualties in its first or second position. Quotes are presented where I think they belong, but do know that it's possible that I'm misapplying comments between the Benton Road bend position and the Starkweather's Hill position. If you can correct/enhance/sharpen my hasty analysis, please feel free to contact me or leave a comment below. The 1st Wisconsin and 79th were ordered up to support the battery and hold that position at all hazards. 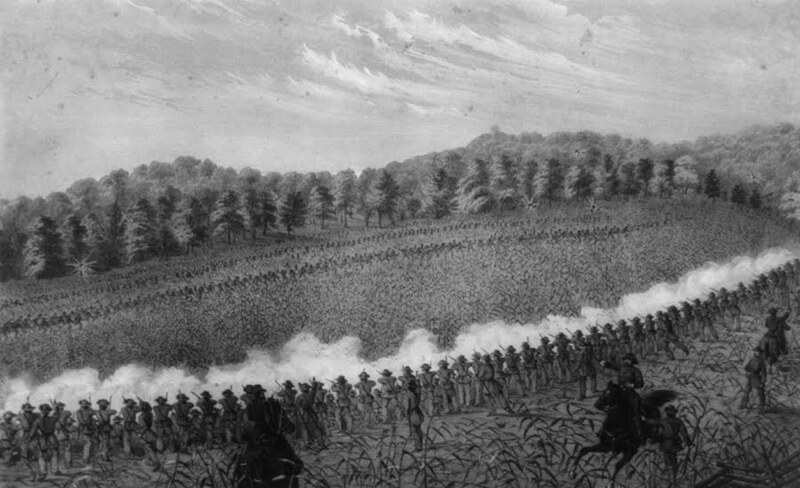 As the solid, serried ranks of glistening bayonets and brave men moved onward with all the regularity and precision of a dress parade, and with the steadiness of veteran troops, the two regiments involuntarily paid a just tribute to the other by sending up long and loud cheers of hearty approval. It was a spontaneous tribute to the others soldierly bravery and appearance. Like twin brothers they marched on side by side and calmly awaited the enemy's onslaught. A rookie regiment in Starkweather's brigade, the 21st Wisconsin, was (pointlessly?) stuck out in front on lower ground by a cornfield. Behind that regiment was a stronger main line on the ridge, consisting from left to right of the more experienced 1st Wisconsin, 79th Pennsylvania, and 24th Illinois. The exhausted and inexperienced brigade of William R. Terrill was positioned in front of Starkweather's brigade in a weak position that would have been Starkweather's had Jackson's division not cut in front of him on the march to the battlefield. The Confederate attack first hit Terrill, whose brigade was positioned on the "Open Knob." After some hard fighting, Terrill's line gave way around 3:30pm and ran to rally behind Starkweather's line. The advancing Confederates next hit the 21st Wisconsin, who also broke and fled to the rear after a couple volleys. Col. Hambright later wrote that it was "sickening" that as soldiers on the retreat ran through his regiment's ranks, "shouting to my men to give the rebels a fire, then run." Clark recorded in his diary that the routed Union soldiers yelled, "The Secesh are coming, run for your lives!" Starkweather's three regiments (minus the 21st Wisconsin) and two batteries now had the responsibility of stopping two surging Confederate brigades. 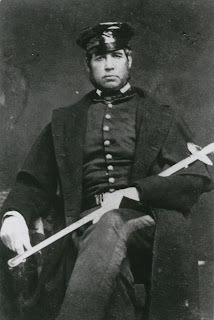 Although roughly positioned to support each other the 1st Wisconsin, 79th Pennsylvania, and 24th Illinois lines were not fully connected, and to Col. Hambright it felt like the regiment stood alone on the hillside "without support of any kind, no artillery, nothing but their own determination." As Col. Hambright moved his men into a position that Gen. Rousseau ordered "held at all costs," Rebel sharpshooters in dense woods and undergrowth in front of and below the regiment's line on the hillside. Hambright wrote in a letter to his former senior captain (who had been captured by Morgan's raiders back in May), "the enemy opened a most destructive fire on us while moving by the flank, but it had no effect to cause unsteadiness. We gained the point ordered too, and faced the enemy in largely superior numbers, and opened a fire that soon gave us a clear space in front." At this point the balls came thick and fast, and the whistling of them I shall never forget. We were all lying flat on the ground and could hear them distinctly. We were then ordered in line, which position we took on the double-quick, under a heavy fire, but before we had a chance to fire a shot, many a one of the glorious 79th fell. There we stood and fired for three hours, as fast as arms could move, without giving way an inch. The Confederates aimed to seize one of Starkweather's batteries and struck the 1st Wisconsin. The 79th Pennsylvania assisted with an oblique fire and began taking casualties as they traded volleys with Confederates attacking from a position covered with underbrush in front of the 79th Pennsylvania. Two 79th Pennsylvania officers, Capt. Samuel Boone and Lieut. 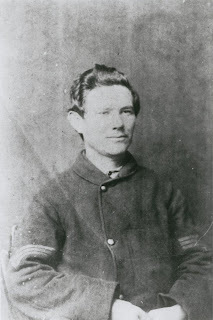 Henry Test of Company C, fell dead almost immediately. Hambright recounted, "The men fell so fast at one time that it required all my efforts to close the lines." Quartermaster Sergt. Marshall tied his horse by a hospital (never to see it again), grabbed a musket, and joined friends in Company B. He wrote, "During the engagement we kept continually closing up to the right, so that as our line became shorter and shorter, we all knew what dreadful havoc the secesh balls were making in our ranks." After the initial fighting, a Confederate battery that began firing from the left flank attracted Starkweather's attention and caused concern. In response, he planned to move his line back to its position before ordered forward by Rousseau First, he would remove his artillery, and his three infantry regiments were to follow. Before Starkweather's plans could be executed, the Confederate brigades of Maney and Stewart--encouraged by the sight of the evacuation of the Union artillery--renewed their attack. Sergt. Marshall wrote, "The rebels took courage at [the retreat of Starkweathers' batteries] and followed up their advantage with a yell. The 79th was now exposed to the whole of their fire." The regiment responded by delivering such a "raking fire that they scattered in all directions. And then went up a yell such as only Lancaster county can give--well, the fact is, the boys were shouting and cheering and yelling all the time." At the battle's height, General Rousseau paid a visit to the regiment in an incident frequently retold after the battle. Marshall wrote that "Gen. Rousseau rode up to us, and waving his hat, said, 'The 79th never leave a stain on old Pennsylvania!' and we answered him with three deafening cheers, and all this during the hottest of the fire. So you can perceive how cool and self-possessed the men were." Chamberlain wrote that Rousseau called the 79th Pennsylvania "his 'Stonewall.'" Sergt. John Dean of Company A was the color bearer and wounded in the wrist. The colors were "shot away" four times. Col. Hambright and Adjutant Lyman Bodie each took turns borrowing the flag to encourage the regiment, and/or wave a silk flag that Hambright produced from his coat. The 1st Wisconsin on the 79th Pennsylvania's immediate left fought off the attackers in hand-to-hand combat to save the Union batteries. In the smoke of battle, the Lancaster County soldiers perceived a dark blue Polk flag as a "black flag" and inferred the Confederates were under a take-no-prisoners policy, which only steeled their nerves. As the 1st Wisconsin counterattacked, Col. Hambright swung his two leftmost companies, Companies B and G, out to "pour a cross fire that perfectly withered the advancing files of rebels." One Confederate regiment left its flag behind as it fled, and the 1st Wisconsin picked up the flag and claimed credit for its capture, a source of griping for many in the 79th Pennsylvania after the battle. Years later, Sergt. 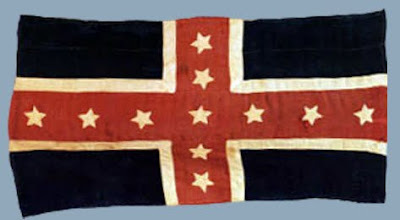 John Durham of the 1st Wisconsin received the Medal of Honor for retrieving this flag. Shot down by 79th Pennsylvania? Casualties continued to mount. Honorary Company B member Sergt. Marshall was hit in the ankle harmlessly by a spent ball and nearly escaped when a shell exploded "within a few inches of my right foot and flew into a thousand pieces, severely wounding a man in the arm but without striking me at all." Others weren't so lucky. 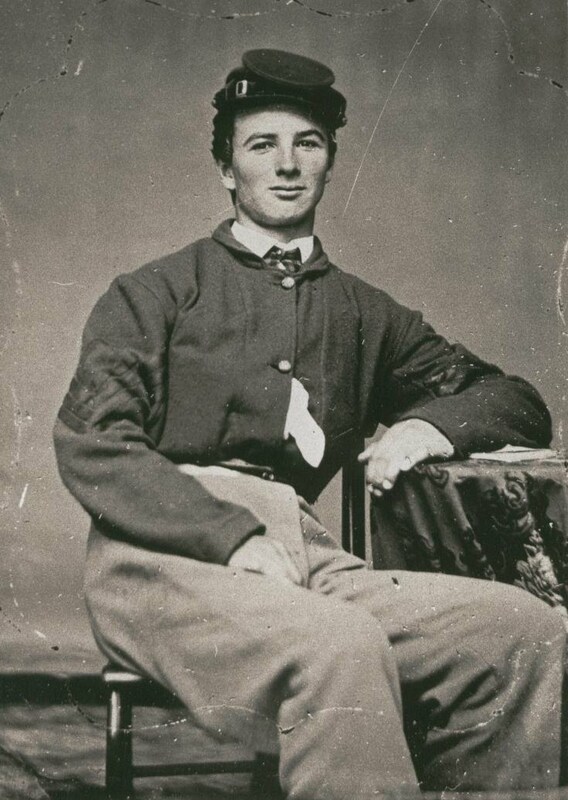 William T. Clark was wounded three times but kept fighting, writing about it at day's end, "I am wounded in the side flesh wound, buck shot between the elbow & one near the right shoulder, all flesh wounds & I will soon be able to take my place in line." Sergt. William Eckert was wounded twice before struck by a third ball that killed him. I looked around where Fred fell, and he was looking toward me, as soon as he noticed me, he beckoned for me. I stepped aside a few steps, for he was shot alongside of me, and I got him out of ranks, he bid me goodbye, and told me not to attend to him, but return and revenge him, this I done as well as possible, and bullets never went into hotter muskets with a more stead and determined hand. You could see the miserable looking varments trying to creep up on you, crack would go our muskets, down go the game. I don't know, but I think they got their fill, and I am certain in saying that Sener and Keller were revenged. In Fred's last moments he was insane, and accused me of having water by his side, and refused him a drink. Many, many a man fell by the balls of the 79th, and our ranks suffered severely as the accounts will show. My right-hand man was wounded; my rear man also. H. Snyder and H. Young, both next me on the left, were wounded and fell, and I was left alone for awhile. There were sixteen wounded in our company. D. Leonard was slightly wounded in the hip, the ball going through his cartridge box; but he still kept blazing away. After repulsing the series of Confederate attacks and allowing the Union cannon time to be safely removed, Starkweather's line was able to move back to its second position. The 1st Wisconsin, 79th Pennsylvania, and 24th Illinois, kept their alignment but now stood behind a low stonewall on a steeper, higher ridge. Marshall wrote, "We changed our position, and it all seemed as cool as though going through a dress parade." The Seventy-ninth took up 3 positions. First at the bend in the Benton Road, Second on Starkweathers Hill, third at Stevens Creek. According to Noe and Hafendorfer anyway.